Many places offer bushcraft and survival skills courses. Is there a difference between these two and if so, why does it matter? The answer is quite simple. There is a pretty big difference. And it does matter. The basic definition of survival skills is to possess the ability to survive in the wild in an emergency situation. We’re talking about a few hours, at most a couple of days, in which you, the survivor, will be able to use learned skills and available technology to get yourself to safety, or to keep yourself safe until you are discovered/rescued. A lot of survival training is about priorities and decision-making. Essentially this means defining our survival priorities (safety, shelter, water, communication/transportation/navigation/signalling, food) in roughly that order, and then being able to undertake meeting those needs using whatever is to hand, whether it’s part of the natural environment (friction fire-making) or not (a lighter plus perfume as an accelerant to get the fire burning well). It’s a short-term mindset that might involve behaviours that aren’t great for the environment – if the car breaks down in a remote part of the country and we’re travelling with a frail person who can’t hike to safety, we might decide to siphon out the petrol and start a fire to signal our whereabouts, even though that’s hardly environmentally friendly behaviour! These are longer term skills that allow us to thrive in the natural environment without harm to ourselves or that environment. Using the example above, it’s about hiking into that remote area, carrying only what we need, and then using that natural environment to meet our needs with respect for nature’s processes and the whole ecosystem that supports us in our bushcraft. This skill-set gives us confidence in our knowledge and security about our ability to adapt to our environment. It means we can build an appropriate shelter instead of needing to carry a sleeping bag. It allows us to forage food and hunt on a long-term basis so that our nutritional needs are met and we remain strong and active. 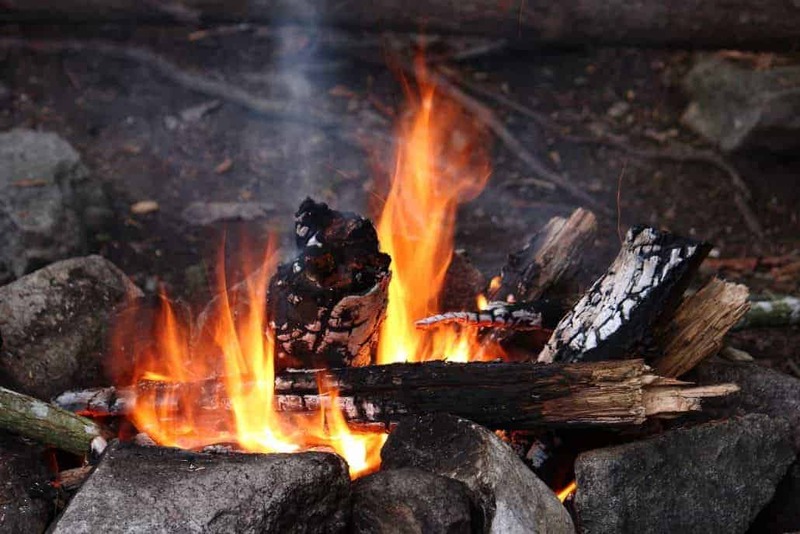 It’s about learning skills that our ancestors knew such as friction fire making, bow hunting, flint knapping, butchering, and preserving found food. Of course, there are areas where these two skill sets overlap. Navigation, for example. Using evidence in our natural environment to find our way to safety is an ability that both forms of training would contain, and basic shelter construction is also essential to survival and a necessary part of developing bushcraft. Being able to read your surroundings, predict weather and appreciate changes in the environment that tip you off to future events (birds roosting as a sign it will soon be dusk etc) is also a crucial talent. The difference between the two sets of skills is partly one of degree and partly one of commitment – many people start out learning survival skills and become fascinated by the process of bushcraft because it allows them to enjoy their surroundings, not just survive in them! I always like to see people noticing the difference between survival and bushcraft and the even larger divide between a survivalist and a bushcrafter. As many are, I am disturbed by the media coverage of outdoor skills and it’s gravitation towards survival and fighting against nature. Living in the states, I can confirm it is quite bad here. I have not yet been able to find a course, group or individuals without that unhealthy fight or flight tinge of survivalism. It saddens me that people of my generation (I’m 24) are so separate from the natural world, even if you are into “survival” more oven then not (I recognize the exceptions) it is a fear based fight to win over nature as your obstacle, meaning you are not connecting with nature by other than selfish means. I hope I can find people some day that I can share skills and philosophy with. Until then I will be reading articles and watching videos that resonate with a heathy mindset and drive to connect to our natural home in a sustainable and kind way.